According to the Romanian legislation, also imposed by international standards, current best practices in use in R&D activities and aligned with INCAS internal policy, the General Director has direct responsibilities in several specific areas. Advisors Unit : - INCAS uses a special unit of advisors, mainly for complex industrial projects, based on a group of personalities with proven record of achievements in aerospace sciences and industry. The General Director is assisted by this group, also participating to the strategy development of INCAS. 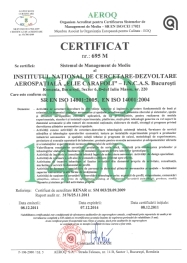 Quality : The General Director is the company responsible person for the overall quality policy . 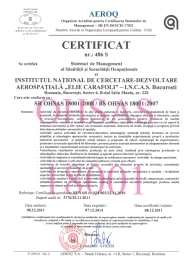 INCAS is a ISO certified company (series 9, 14 and 18), also meeting the certification requirements for quality from military areas. Security : The security structure in place at INCAS is under direct supervision of the General Director, according to Romanian legislation. 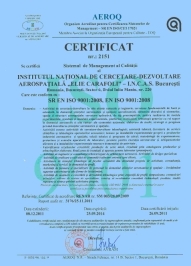 PSI & PC : Local civil protection and fire protection units are under the direct responsibility of the General Director, according to specific Romanian legislation. SSM : This is a direct responsibility for the General Director, imposed by the labor legislation in Romania, also aligned with international legislation and best practices. Audit : The General Director of INCAS is in charge with the internal auditing of the company. This specialized activity is enabled using contractual work from external service supplier. The Organization Diagram include these units under direct coordination of the General Director. Activities with respect to specific policies are performed by specialized personnel, most of them already part of the basic organizational structure. For maximum efficiency, specialized support in several units is enabled via external contracts.